However there was a twist, pun intended. The customer wanted this cable turned into a coil cord that could slide inside a telescoping tube with an inside diameter less than an inch. Needless to say this isn’t the run-of-the-mill coil cord design. First we started with the custom cable. Our customer had very specific criteria for each of the conductors. We worked closely with our customer’s engineers to understand what needed to happen, and shared our knowledge and experience with them to find a solution. This allowed them choices in their design process. All during this time we kept the focus on the fact that this would be a coil cord eventually. We finalized the cable design, extruded the cable and then set about making the coil cords. Early on the issue wasn’t creating the cable, for us that was fairly easy. The bigger issue was making this complex of a cable into a retractable cable; a retractable cable solution that worked inside a one-inch pipe. 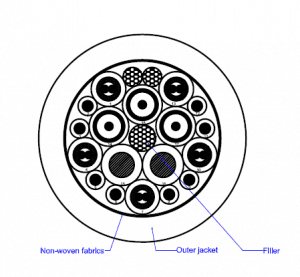 During the cable design phase, we constantly made sure our customer knew the choices, and impacts of, stranding, conductors, insulation materials, shielding options, jacketing materials and construction methods. Doing this allowed us to balance the electronic performance and the mechanical performance. The final cable had an OD of only 0.291 inches, and when turned into a coil cord did in fact work inside the pipe. A solution was found! 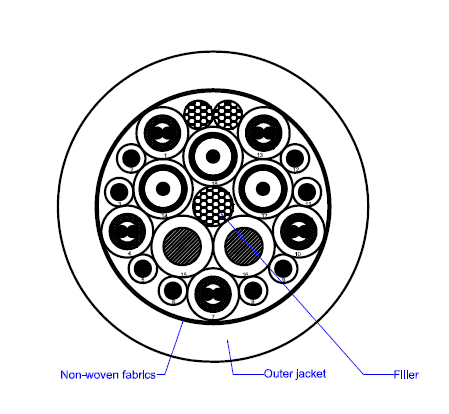 Meridian Cable can design cables as complex as this, simpler and more complex too, and we would welcome sharing what we know with you. We have engineers that are happy to talk about wire and cable all day long. Your cables are unique; your vendor’s solutions should match. ← Meridian Cable Assemblies Grows — Welcome Jennifer!